Television news coverage showing Kenneth Deveau in a stretcher at a North Andover shelter after he was evacuated during the Columbia Gas explosions in Merrimack Valley. Attorney Marc L. Breakstone has confirmed to the media that Columbia Gas and parent company NiSource will face a second wrongful death lawsuit following the Merrimack Valley gas explosions. 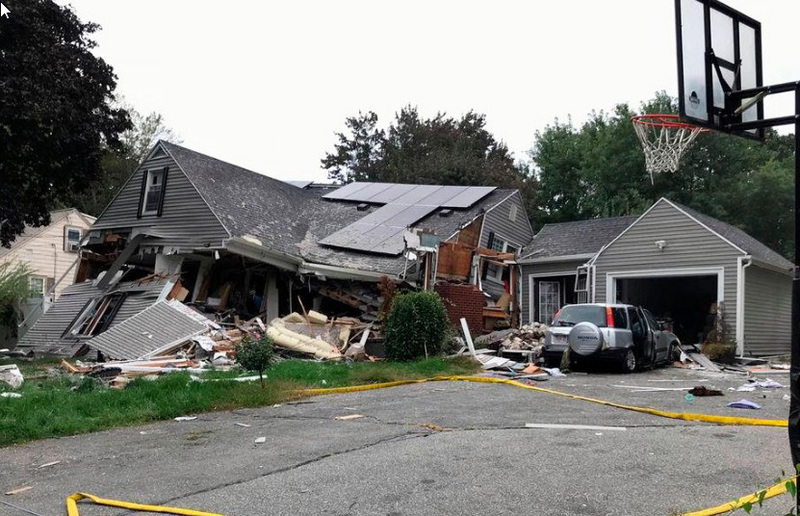 Attorney Breakstone is representing the family of the late Kenneth DeVeau of North Andover, who suffered cardiac arrest and slipped into a coma after the Sept. 13th explosions. DeVeau, 57, suffered from illnesses such as Myotonic Dystrophy and a weakened heart, and had limited mobility due to a chronic neurological condition. DeVeau suffered the heart attack and injuries at an evacuation center. He was then transported to Lawrence General Hospital, where he briefly regained consciousness. He died from complications on Sept. 26. Attorney Breakstone said the family has not yet filed the wrongful death lawsuit. They will do so once DeVeau’s sister is appointed the personal representative of his estate. NiSource disclosed the second wrongful death claim yesterday when it filed its quarterly financial disclosures with the SEC. The company noted two parties had reported their intent to assert wrongful death claims after the Columbia Gas explosions in Merrimack Valley. Prior to this, only the family of 18-year-old Leonel Rondon had announced its intention. If you have been personally affected by the Columbia Gas fires and explosions or the interruption of gas and electric service, we are here to help you. Breakstone, White & Gluck of Boston is currently assisting individuals injured in the explosions and fires, homeowners and tenants whose property was damaged, as well as families whose gas and electric service was interrupted. It is important that you know your rights. 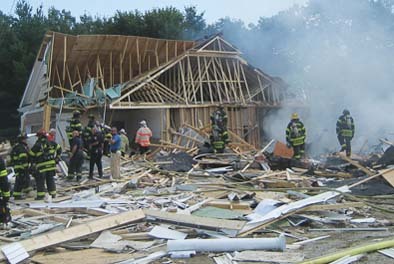 Our Massachusetts law firm has extensive experience representing victims of explosions and fires. If your family or business has been affected by the Columbia Gas explosions in Merrimack Valley, contact Breakstone, White & Gluck to learn your rights. Please call 800-379-1244 for a free legal consultation with one of our attorneys. The 70 gas fires and explosions caused one tragic death and more than 25 injuries. Beyond physical injuries, countless residents who smelled gas and ran for their lives have been traumatized by the events of September 13, 2018. The fear for one’s life and safety is real in the face of random explosions and fires in your community. If you or a loved one is experiencing symptoms such as nightmares, flashbacks or anxiety you may have a right to bring a claim for emotional distress, even without physical injuries. We are here to speak with you and advise you of your rights to bring a claim for emotional distress. 8600 Columbia Gas residential and business customers have no gas service which means no hot water, no heat or no cooking. If your gas service has been cut off, you have been harmed. Columbia Gas just announced that it may take “several months” to restore gas service to these families and businesses in the Merrimack Valley. This is chilling news for every Columbia Gas customer, including homeowners, tenants and businesses. Columbia Gas has distributed hot plates and space heaters to 6000 gas customers who are without service. But is this enough? Can a family of five be fed off a 2 burner hot plate? Can a single space heater warm a multi-room home or apartment? What about hot water? If you are asking these questions, you likely have a claim for the interference with the use of your home or business. We are here to help you. Every Columbia Gas customer (property owners, tenants and businesses) who will be without natural gas for hot water, heat or cooking will be seriously affected. How will families live in their homes and apartments without hot water for showers and bathing? How will people endure the winter without heat? Even if you or your home did not have property damage, you may be entitled to be compensated for the interference with your use and enjoyment of your property as a result of the loss of your gas service. This is recognized claim for “nuisance damages” under Massachusetts law. Given the uncertainty about how long gas service will be interrupted, it is important that you know your rights. We are here to help customers facing the prospect of living in homes and operating businesses without gas service. Read about our gas explosions claims experience. We urge you to consult with an experienced Massachusetts gas explosion lawyer before you sign off on any payments by Columbia Gas or any of the funds established to assist fire and explosion victims. Breakstone, White and Gluck has over 100 combined years of experience helping families who have been seriously injured or displaced due to fires and gas explosions. We are here to assist and advise you about your rights. Call us for a free consultation at 800-379-1244 or fill out our contact form. We just learned that it may take “several months” for Columbia Gas to restore gas services to 8600 families and businesses in the Merrimack Valley. This is chilling news for every Columbia Gas customer, including homeowners, tenants and businesses. Every Columbia Gas customer who will be without natural gas for hot water, heat, or cooking will be seriously affected. How are families going to live in their homes and apartments without hot water for showers and bathing? How will people endure the long winter without heat? Even if you or your home did not have property damage, you may have a legitimate claim for compensation. If you are a customer of Columbia Gas facing these hardships, you need to know your rights. You may be entitled to be compensated for the interference with your use and enjoyment of your property as a result of the loss of your gas service. This is true for property owners, business owners, and tenants. Anyone who lives in a home or apartment that is without gas for heat, hot water, or cooking has a potential claim. Every business customer of Columbia Gas will be hurt. Given the uncertainty about how long gas service will be interrupted, it is important that you know your rights. This type of claim is recognized by the law of Massachusetts. We are here to assist and advise you about your rights. We are Boston-based lawyers who have represented Massachusetts families and businesses that have been affected by gas explosions and fires for over 25 years. Feel free to call us for a free legal consultation: 800-379-1244. You can also use our contact form. If you were ordered to evacuate your home or business because of the recent Columbia Gas leak and explosions, you may have a right to compensation for the costs associated with your displacement. If you have returned to a home or business that has had the gas service shut off, you may also be entitled to money damages for interference with the full use and enjoyment of your property. This is what is called “nuisance” damages. Whether you own or rent, if you are living in a home or apartment with no gas, no hot water or no fuel for operating basic appliances, you have the right to bring a claim for compensation. Thousands of customers of Columbia Gas have been so affected. Homeowners, tenants and business owners have the right to file these claims. We urge you to consult with an experienced lawyer before you sign off on any payments by Columbia Gas or any of the funds established to assist fire and explosion victims. Breakstone, White & Gluck has over 100 combined years of experience helping families who have been injured or displaced due to fires and explosions. We have also represented many seriously injured individuals in home fires and explosions. As an example, Breakstone, White & Gluck successfully recovered $7.5 million for the family of William (“Billy”) Nichols in a wrongful death lawsuit. Mr. Nichols was an electrician, working in a new construction home when it exploded due to leaking propane gas. He suffered under burning embers for one hour before he died of his injuries. Our attorneys aggressively litigated the case which resulted in a recovery for the family. Watch this video of Scott Nichols who talks about his experience being represented by our firm.